Our most advanced technology in a magical & revolutionary device at an unbelievable price. The words ‘magical’ and ‘revolutionary’ in particular really stuck with me. I setup this site on that same day and launched it 2 days later. I knew that those two words were going to be awfully hard to live up to, especially when many people were quickly writing off the iPad as ‘just’ a giant iPod Touch – but I also thought it was the most exciting mobile device I’d ever seen and it was going to be lots of fun seeing whether it could live up to the hype. And boy have these 3 years flown by. Last October Apple reported they had sold 100 million iPads – and that was before the release of the iPad 4th gen and the iPad mini. This week they reported sales of 22.9 million iPads last quarter. The iPad is a huge consumer hit, has a massive presence in the enterprise, and has had great impact in the healthcare and education spaces as well. There are now over 175,000 apps designed specifically for the iPad – covering an incredibly wide range of uses, from entertainment and games to education and productivity and so much more. There are scores of amazing apps that feel as if they just couldn’t be done on any other device. I may be a tad biased, but I’d say the iPad has done a heck of a job living up to those lofty words of Steve Jobs when he introduced it. What do you all think? Has the iPad lived up to its initial hype? He also stated no one would want a 7 inch tablet. It’s all marketing doublespeak. Love my ipad(s) and Nexus 7. First, “hype” is a word with negative connotations. And while the buzz surrounding iPad wasn’t as overwhelmingly positive as the iPhone it was mostly positive. That aside, I think nearly every tablet maker went out if their way to make their tabs look like iPad. Imitation is the sincerest and laziest form of flattery. I will never forget that day… Yes, it lives up to the hype and then some. The content has come a long way since then. The way I use this iPad in my everyday life is incredible. I could never be without it. Steve left us with a powerful source, in the palm of our hands…. 3 years later and my only computer is an iPad 4th gen. I can do almost everything I can do on a Mac and evrything that I need to do. I play games, I learn, I lost myself in beautiful pictures, I teach my child new things about the world, nature, animals, etc. This litlle thing is in the center of my digital life now and there’s no turning back ! 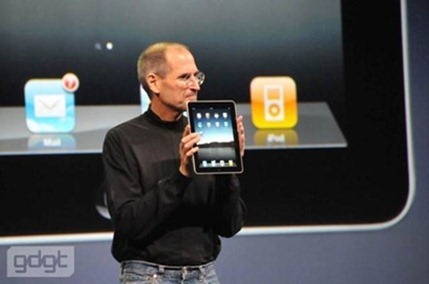 By the way, with the release of iOS 6.1, Apple confirmed that there’S now 300 000 apps specificaly for the iPad !!! Wow ! Happy 3 years birthday !